Run Jen Run: I signed up for the Piggy Trot! I signed up for the Piggy Trot! I won a pig in 2012 for 2nd overall! The Piggy Trot is one of my favorite events every spring! I received an email this morning that I won the raffle from my work’s Charity Matters Team for a free race entry. I was planning to sign up anyway because it’s a great race for a great cause. Not paying for my entry fee just means more raffle tickets for Jen! 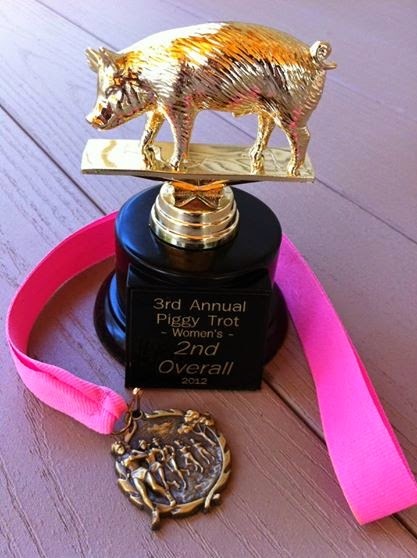 The Piggy Trot is a 3.7 mile race through Osterville, MA that starts and finishes at Dowses Beach. The race is put on by the Glenna Kohl Fund for Hope and I'm proud to say Cape Cod Rehab has been a sponsor for at least the last 4 years. Glenna (nicknamed “Piggy”) was a Town of Barnstable lifeguard who passed away from Melanoma at a very young age and her charity raises money and awareness in honor of Glenna. One of their missions is to support and protect Cape Cod lifeguards by supplying sunscreen and putting up shades canopies on lifeguard stands. You can join me on May 18th by registering through the Glenna Kohl Fund for Hope website. They also take monetary donations if you are unable to attend. "You gain strength, courage, and confidence..."
"In the midst of an ordinary training day..."
6 Weeks til the Piggy Trot!